When hemp was being classified by the New Zealand Food Safety Association, scientists testified that having hemp in people's diets would improve longevity, reduce the incidence of conditions like diabetes and heart disease, and would generally improve health, but the politicians didn't want a bar of it because they have a 'War on Drugs' to fight and they only wanted bad things to be associated with the cannabis plant (hemp is the non-drug variety of cannabis). The politicians won out mostly! * The only hemp seed product that we can sell for human consumption in New Zealand is hemp seed oil. 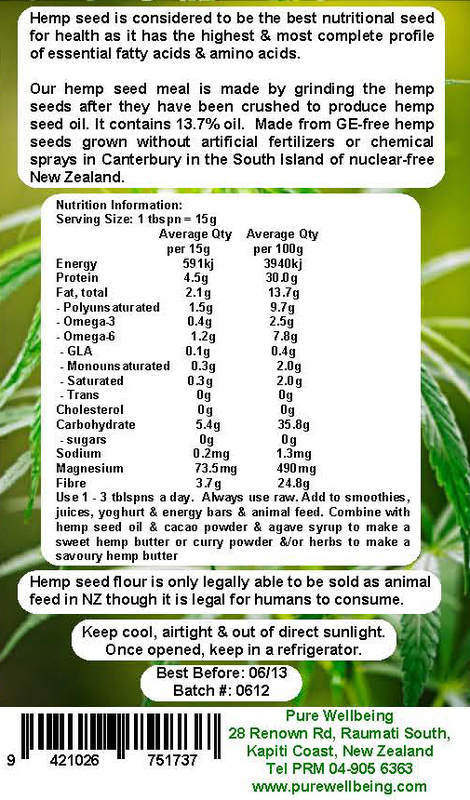 * Uncrushed hemp seed is not allowed to sold at all either for humans or animals in New Zealand. (In the USA & many other countries sale of all hemp products as human food is legal). * However it is legal to sell crushed hemp seeds & hemp seed meal to you to feed your animals! This means we can sell crushed hemp seeds and hemp seed meal for animal feed only, even if it is made to human food-grade standard and would be perfectly safe (beneficial even) for you to eat. 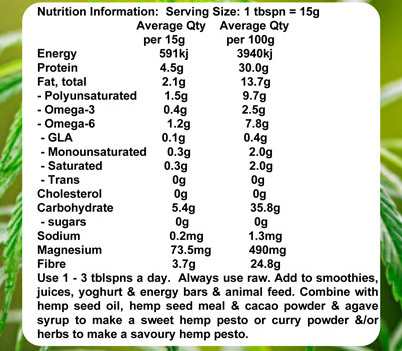 This regulation only effects the point of sale - it is legal for you to consume crushed hemp seeds & hemp seed meal. Our hemp products are grown without chemicals on the Canterbury Plains of New Zealand. Hemp has been called the perfect plant. Hemp seed oil contains what is considered to be an ideal ratio of Omega 6 and Omega 3 fatty acids- 3:1, perfectly matching the needs of the human body. In addition to the EFAs hemp seed provides, it is also one of the richest sources of amino acids. Along with the EFAs, these two components are responsible for keratin formation, the primary protein that gives your hair structural integrity. Hemp is quite simply, nature's health and beauty secret - and the secret is in the seed. Hemp seed oil and extract offer many benefits useful in personal care products. 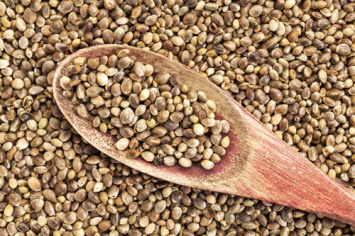 The reason hemp is so effective is largely because of the essential fatty acids (EFAs) it contains. More than 75% of the EFAs in hemp seed oil are poly-unsaturated fatty acids (PUFAs), known for their excellent emollient and lubricating properties. Hemp seed can be processed, much like soy, into many nutritious foods and cosmetic ingredients. Hemp seed is far more nutritious than even soybean oil and though it contains less total protein, it is far more digestible to humans. Hemp seed contains, on average: 25% protein, 30% carbohydrates, 15% insoluble fibre, 30% oil, the nutrients carotene, phosphorous, potassium, magnesium, sulphur, calcium, iron, zinc, and the vitamins E, C, B1, B2, B3, and B6. Hemp seed also is one of the few seeds to contain Omega-6 and Omega-3 Linoleic acid, commonly found in fish and useful to the immune system. Hemp oil has been found to be a highly nutritious, essential hair and skin aid for protection, growth and anti-aging. Hemp has excellent healing and moisturising properties. Because of its EFA profile, hemp seed oil instantly counteracts the effects of degreasing and dehydration, conditions that produce dry skin and hair. In addition to improving the structural quality of the hair, hemp seed oil's high lipid content helps increase elasticity, volume, combability and shine. Hemp is used as fibre for rope, twine, tough cloth, and paper as well as other products where wood pulp is currently used. Hemp could help preserve natural resources. For instance, hemp used for paper would replenish itself in 90 days instead of the 20-40 years required to grow trees. An acre of hemp can produce 4 times the amount of paper that an acre of trees can produce. Hemp requires no herbicides or pesticides for cultivation and refertilises soil naturally making the ground useful for future crops. Hemp has been in continual use by human civilization for at least 10,000 years. The first written record of cannabis was supposedly penned by one of the early Chinese emperors around 2700 B.C. Islamic/Arabic empires created Europe's first paper mill utilizing hemp in about 1150 A.D. In 1563 A.D., as part of the economic and military build-up of the time (80 years war), Queen Elizabeth I orders all land owners with 60 acres or more to grow Cannabis or face a £5 fine. For centuries the fibre of the hemp plant has been used for rope, sails and other textiles. Early drafts of The Declaration of Independence and The Constitution were written on hemp paper. George Washington and Thomas Jefferson both farmed hemp crops – the colonists were legally bound to grow hemp as one of their crops and could use hemp to pay their taxes. During times of shortage, farmers were sent to jail for not growing hemp. In 1941 Popular Mechanics introduced Henry Ford's new plastic car, manufactured from and fuelled by hemp (an early bio diesel variant). Hoping to break the petroleum industries' monopoly of control on his company, Ford illegally grew hemp for over a year. The 1942 Japanese invasion of the Philippines cut off the US supply of Manila hemp, among other vital resources. The US government distributed over 400,000 pounds of hempseed to farmers in order to limit the supply gap as much as possible, subsidizing hemp cultivation during WWII. American farmers grew about a million acres as part of that program. In New Zealand hemp businesses began to appear, in more recent times, during the early to mid 1990s. Hemp product availability has continued to grow ever since. By 2004, a few U.S. states had again legalised production of industrial hemp and this continues to grow. 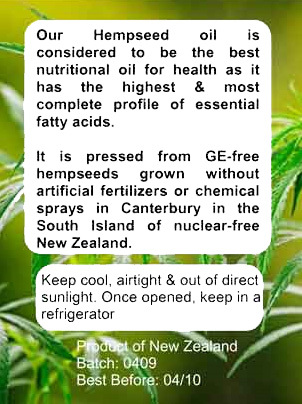 In 2005, for the first time a New Zealand hemp seed oil was available in health stores and outlets. 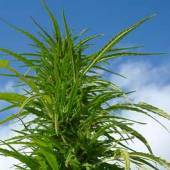 Last year, a successful venture by two Canterbury businesses culminated, in March of 2006 with the first harvest of Hemp on a commercial scale in New Zealand. The crop was grown spray free and required very little irrigation. Hemp seed oil is considered to be the most nutritional of all oils available. It has a plethora of medicinal, nutritional, and cosmetic uses, making it a wonderful multi-purpose ingredient. It has been used for many years medicinally, and was even used during Ming Dynasty by the Chinese under the name of Ma Zi. Hemp seed oil provides the body with complete protein, nutrition, and with all the essential amino acids necessary for health and wellness. Hemp seed oil is a highly nutritious food, and contains antioxidants, protein, carotene, phytosterols, phospholipids, as well as a number of minerals including calcium, magnesium, sulfur, potassium, iron, zinc, and phosphorus. 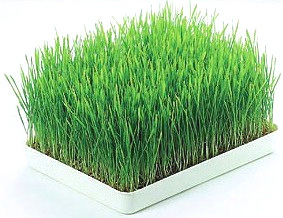 It is a source of complete protein and contains all 20 known amino acids, including the nine essential amino acids. It also contains Vitamins A, B1, B2, B3, B6, C, D, and E. The green color in hemp seed oil is a result of the high level of chlorophyll which is naturally present in the seeds. Perhaps the most valued property of hemp seed oil is its percentage of essential fatty acids, which is higher than any other plant in the world. It contains both Omega-6 and Omega-3 essential fatty acids, in a proportion of 3:1. This proportion is the recommended balance of Omega-6 to Omega-3 acids, making it a simple perfect way to complete your diet. In cosmetic and body-care products, hemp seed oil is anti-inflammatory, anti-ageing, balances dry skin, fights skin inflammations, helps heal skin lesions, has antioxidants, and contains moisture balancing properties. The oil is non-greasy, readily absorbs into the pores, is an emollient, and has rejuvenating and moisturising properties for the skin. Adult users of hemp seed oil have reported softer skin, and stronger nails and hair after only a few weeks of using 1-2 tablespoons per day. The vitamins and minerals present in hemp- seed oil are easily absorbed through the skin, resulting in a more vitamin and mineral-enriched body-care product. The pleasantly nutty taste of hemp seed oil makes it easy to incorporate into your culinary recipes. In one tablespoon, you will receive 2.5 grams of Omega-3 fatty acids, 8 grams of Omega-6 fatty acids, and 2 grams of Omega-9 fatty acids - a perfect balance. No other single source oil has this ideal combination of essential fatty acids. Hemp seed oil is easily digestible in its raw state. It contains less than 10% saturated fats, and 70-80% polyunsaturated fatty acids, the highest of any vegetable oil . This is an unusually high level of the good oils, making this oil beneficial for culinary use. In culinary use, the oil will not clog arteries, as do saturated and trans fatty acids or shortenings. This oil should not be fried, and should preferably be used cold. It may easily be added to salad dressings, pasta, vegetables, smoothies, soups, sauces, hummus, guacamole, pesto, or other foods after the heating/baking has been completed. If you must heat the oil, it may be gently heated for a short period of time. Unlike flaxseed oil, hempseed oil can be used continuously without developing a deficiency or other imbalance of EFAs. This has been demonstrated in a clinical study, where the daily ingestion of flaxseed oil decreased the endogenous production of GLA. Hemp seed oil may be added to any body-care or cosmetic product, including creams, lotions, facial or body oils, massage oils, shampoo, conditioner, shaving products, lip balm, soap, and any other product. In hair care products, it increases elasticity, manageability, and shine. Recent Canadian research has shown this oil to possibly be effective as a broad-spectrum ultraviolet skin sunscreen. This is a raw hemp high protein powder suitable for vegans, vegetarians and anyone who wants to boost proteins in their diet without having to consume whey or soy proteins. This protein powder is an amazing product. With a total complete protein of approximately 45% this is the best of the of seed & nut based complete proteins. 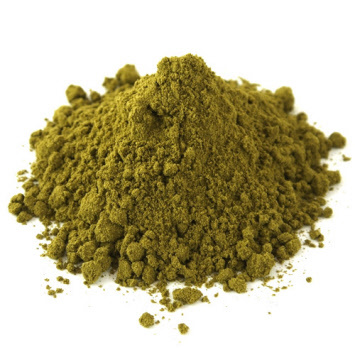 Hemp protein is recognized as a complete/balanced vegetarian source of amino acids; EFA’s; natural anti-oxidants, vitamins, minerals, fibre and chlorophyll. Our hemp protein powder is the perfect high performance vegetarian whole food and may be used in place of other protein supplements. It is easily digested (no enzyme inhibitors) and can be added into any diet. Add to smoothies, juices, yoghurt, energy bars and animal feed. Combine with hemp seed oil, hemp seed meal & cacao powder & agave syrup to make a sweet hemp pesto or curry powder &/or herbs to make a savoury hemp pesto. Our new hemp seed flour is a medium-ground animal grade quality product. Grown naturally without chemicals on the Canterbury Plains of New Zealand, hemp seed flour is made from the pure milled food-grade hemp seed flakes above. This hemp seed flour is not recommended for human use. We recommend the 30% and 45% hemp protein powder above for humans. 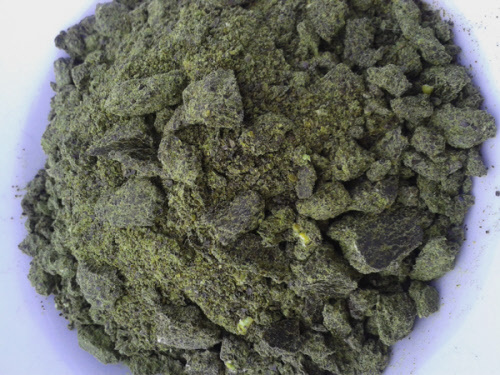 It can supplement any feed mix for pets, horses, fish, birds or animals of any kind! 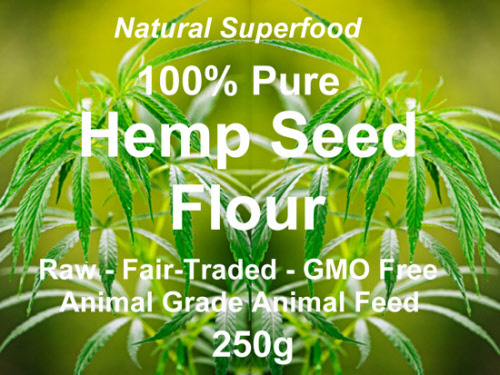 Hemp seed flour is a rich source of complete protein, being over 30% high-quality proteins. It is also a great source of Omega essential fatty acids including Omega-3, -6 and -9, is high in energy and also high in fibre. Hemp seed flour contains about 9 - 10% of the oil of the whole seeds. Store in a dark, cool place. Shelf life is at least one year. Once opened, hemp seed flour should be kept in the fridge and is best consumed within 3 months. Under NZFSA regulations, hemp seed flour is only able to be sold as animal feed though it is legal for humans to consume. 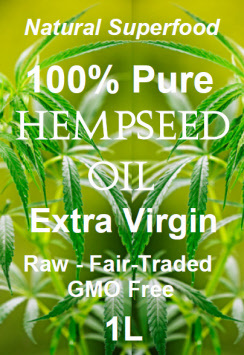 We are pleased to offer the high quality culinary hemp seed oil, created from the finest locally harvested hemp. 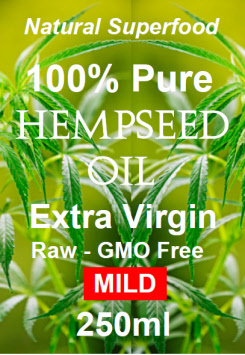 Hempseed oil is a miracle of nature. Its unique properties offer fantastic nutritional, health and skin-care benefits...and good taste has never been so fabulous. Rich, nutty and delicate in flavour, this oil contains the only naturally-occurring and perfectly balanced nutritional balance of Essential Fatty Acids, Omega 6 and Omega 3. Hempseed oil is just now coming on the market and supercedes all existing oils that have been used to obtain EFAs in the past (ie flax seed oil, evening primrose oil and borage oil) - what's more, it's the first delicious edible oil to accomplish this. Hempseed oil is cold-pressed to ensure that key nutrients, enzymes and acids are not destroyed and health benefits are maximised. A delicious full-flavoured salad, drizzling and dipping oil, hemega3™ hempseed oil is a fresh and very healthy alternative. hempseed oil is recommended as a base for salad dressings and pasta oils and it enhances the flavour of fish, seafood, meats and vegetables. The human body uses fatty acids from food for building tissues and for specialised functions such as the production of prostaglandins, localised tissue hormones. One major group of fatty acids is called essential fatty acids, which are polyunsaturated, and include two major groups, omega-3 and omega-6 fatty acids. They are called “essential” because the body cannot make them and thus, must obtain them from food sources. 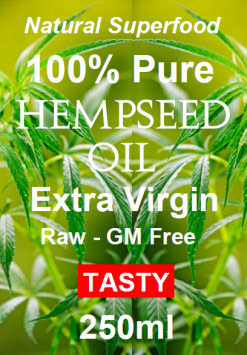 Hemp seed oil is the only edible seed oil to contain over 80% polyunsaturated EFA's and boasts not only the optimum ratio of Omega 3 and Omega 6, but also GLA and SDA. What is the 'optimum Omega ratio' all about? It is likely that excess refined foods, dairy and a lack of whole foods have contributed to this lack of balance, and in turn, our failing health. Through adjusting our diet to allow more natural intake of these EFA's, we can improve our cellular health and maximise long-term vitality. What about GLA and SDA Essential Fatty Acids? Hemp is the only edible seed containing GLA and magnesium-rich chlorophyll, both which are beneficial in helping with PMS conditions including breast tenderness, bloating, cramping and other discomforts. Omega-3 oils have been shown in hundreds of studies to lower triglycerides and cholesterol levels - they are also effective in decreasing blood pressure, platelet stickiness and fibrinogen levels. Numerous studies have shown that the substitution of polyunsaturated fats for saturated fats can reduce the risk of sudden cardiac arrest and high blood cholosterol levels. Research has found that for every 1% increase in omega-3, there was a 5mm Hg decrease in systolic, diastolic and mean blood pressure. These EFA's, especially GLA, have also been found beneficial in both treating and offering protection against various cancers. Omega-3 helps produce PG3 (prostaglandin 3 series), the anti-inflammatory chemicals that work as local hormones in the human body. Numerous studies show that EFAs have positive results in the treatment of many chronic diseases including eczema, itchy skin, acne, psoriasis, lupus and ulcerative colitis. Key fatty acids found in hemp seed oil provide long-term support and maintenance of arthritic conditions, including rheumatoid athritis. The omega-3 fatty acids help nerve cells communicate with each other, which is an essential step in maintaining good mental health. EFAs have been shown to work with oxygen and enhance electron transport, key activities in energy output within the cell as well as enhance nerve cell insulation. Hemp seed oil provides EFAs necessary for maintaining health and flexible skin cell membranes as well as exerting anti-viral, anti-fungal and anti-bacterial properties. EFAs enhance immune function, speed up the rate of immune reactions, help to re-establish population control over intestinal bacteria and improve cellular energy for removing waster materials. Omega-3 fatty acids help support the cardiovascular system during exercise and also reduce the negative effect of intense exercise on the immune system. The hemp is grown organically & processed without chemicals & under 45 degrees Celsius. Organic certification will be applied for at some time in the future. Tasty - This oil has a stronger nuttier flavour. This oil has a stronger nuttier flavour.